Echipa AVmall incearca sa mentina acuratetea informatiilor din acesta prezentare. Cu toate acestea, in anumite cazuri, pot aparea mici inadvertente pentru a caror semnalare va suntem recunoscatori. Ne poti contacta oricand pentru a clarifica eventuale nelamuriri. Nu uita sa mentionezi in corespondenta ta numele exact al produsul. Fotografia produsului Boxa SoundBar Yamaha YSP-2500 are caracter informativ si poate sa difere de produsul real sau sa contina accesorii neincluse in pachetul standard al produsului. Specificatiile tehnice pot contine erori de operare si pot fi schimbate fara instiintare prealabila de catre producator, neconstituind obligativitate contractuala. YSP creates beams of sound by combining the sound projector′s many speaker groups via digital signal processing and reflects them off the walls of the room, actually reproducing a realistic surround effect with the sound coming from the left and right and even from the rear. The listening area is expanded so you enjoy an extremely powerful, natural sense of presence unobtainable with virtual surround methods. 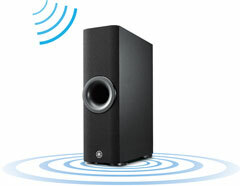 The front unit of the YSP-2500 is equipped with 16 2.8 cm high sound quality array speakers which create beams of sound. It optimises the layout of its array speakers, boosting the reflection properties of the beams to maximise sound quality. And by having the subwoofer as a separate unit, it achieves a superior sense of sound orientation and powerful bass. The result is 7.1ch surround sound with incredibly high sound quality. 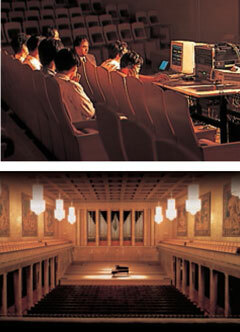 Yamaha′s ultra-sophisticated CINEMA DSP technology creates thrillingly realistic soundscapes in any room. You can select 10 different programmes, including three Movie, three Music and four Entertainment programmes. CINEMA DSP programmes are created by recording actual sound field data in performance spaces around the world, then applying ultra- sophisticated digital processing techniques. Yamaha was the first and is still the leader in providing a truly realistic surround sound experience. The YSP-2500 decodes HD Audio signals to ensure that you hear the best possible sound from Blu-ray Disc players, as well as from all other digital sources. 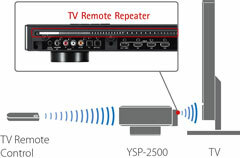 When connected to a CEC-compatible TV, the YSP-2500 will turn on and off together with the TV, and you can use the TV remote unit to control the volume. 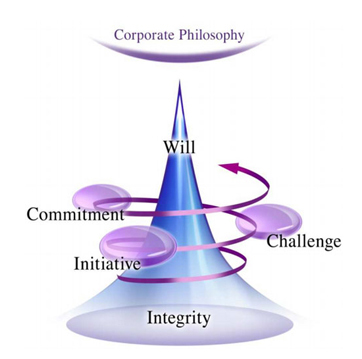 CEC also provides advanced functionality with other components. The front unit with stand is only 73 mm high. The super-low design means that if the stand is not used, the height is 51 mm, allowing placement in front of a TV without blocking the screen. It is also wall mountable with the optional SPM-K20. The top surface of the soundbar is made of one piece of aluminium with superior stiffness, high texture and a hairline finish, for a look that is stylish and imparts a strong feel of luxury. The sides have a mirror finish that harmonises beautifully with the TV. 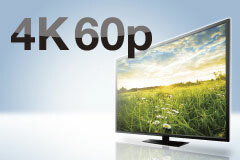 Available in either black and silver, so you can choose the colour that best matches your TV. You can enjoy high sound quality virtual 7.1ch surround sound from headphones. 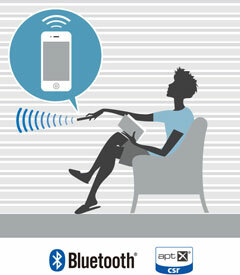 A great way to fully enjoy movies or games with powerful surround sound without disturbing others. Nu sunt recenzii pentru Boxa SoundBar Yamaha YSP-2500. Fii primul care scrie una!